There are still a few more Nike KD 8 colorways surfacing like this Nike KD 8 Uptempo version that is expected to be one of the latest pairs to release before officially showcasing the Nike KD 9. 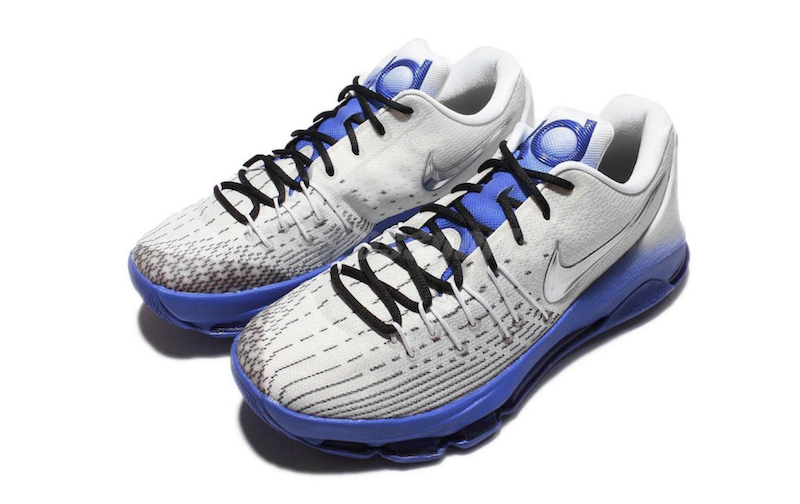 This Nike KD 8 comes dressed in a White, Metallic Silver and Game Royal color scheme. The shoe features an all-White upper that includes Silver accents throughout, including hitting its Nike Swoosh logo that has a bit of a mirror-like detail to it. Finishing off this release is a gradient midsole done in Blue tones. As of right now an exact release date has yet to be announced, but don’t be surprised to see this Nike KD 8 “Uptempo” pop-up at your local Nike Basketball retail stores in the coming days. UPDATE: For those that are looking to buy one of Kevin Durant’s last Nike KD 8 dubbed, “Uptempo” you can find them available now for pretty much retail price via eBay.